This peaceful green and white arrangement conveys your thoughtfulness and deepest sympathy. Designed with carnations, Gerbera daisies, lilies, daisy poms and more, beautifully arranged in a clear glass gathering vase. 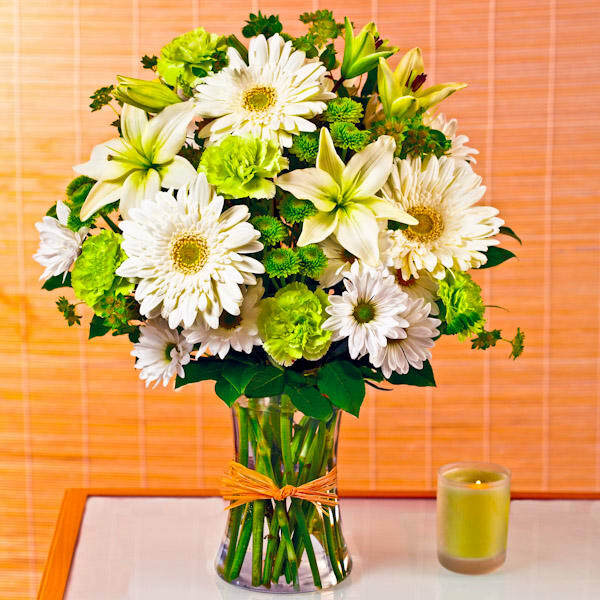 • The freshest carnations, Gerbera daisies, lilies, daisy poms, button poms and more, all in elegant shades of green and white. 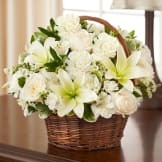 • Arranged by our select florists in an 8"H clear glass gathering vase accented with hand-tied raffia. 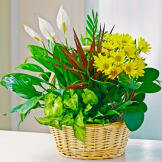 • Appropriate for the service or for sending to the home or office of friends and family members. • Arrangement measures approximately 20"H x 13"D.
Flowers will be received by a Harper Community Funeral Home's staff. 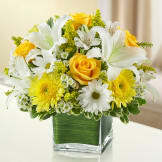 All of our flowers are designed and delivered by hand from a local florist in in New Haven.